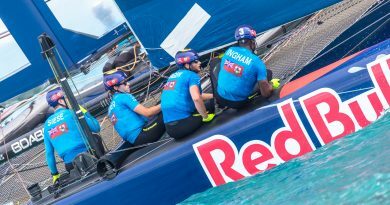 ORACLE TEAM USA skipper Jimmy Spithill sailed out to Bermuda’s Great Sound race course with a different set of foils on Sunday, looking to change things up with a forecast for more wind. With an easterly breeze of 10 to 12 knots, the American defender was on its high-speed daggerboards. But the result was the same as on Saturday. The Kiwi boat was able to lead at mark one in both races and extend for two race wins. 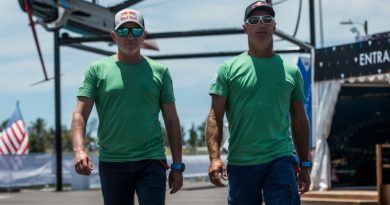 „I think it’s pretty obvious these guys are faster and we need to make some changes,“ Spithill said after racing concluded. „I think these next five days are the most important five days of the campaign. Spithill praised his team and expressed confidence they would be competitive when racing resumes. Racing for the 35th America’s Cup resumes on June 24, with Emirates Team New Zealand leading ORACLE TEAM USA 3-0. The first team to collect 7 points wins the 35th America’s Cup. On the smaller high speed boards, ORACLE TEAM USA was looking to be faster on the reach to mark one in this race. In the pre-start, skipper Jimmy was on the push, and then opted to take the high lane, to windward of the Kiwis on the sprint to the first mark. 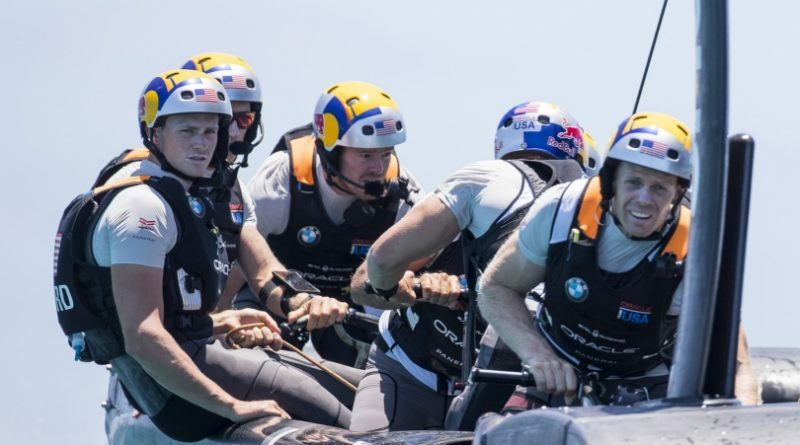 Both boats crossed the line at speed as the starting gun fired and Team New Zealand was able to hold off Spithill from rolling over top, rounding mark one just 1-second ahead. The first gybe was critical, with both boats neck and neck at the boundary. Just a momentary splashdown in the maneuver by ORACLE TEAM USA allowed the Kiwis to eke out in front and that was all it took for them to lead at the first bottom gate. The Kiwis extended from there to take a 2-0 lead in the match. It was another drag race off the starting line, with ORACLE TEAM USA set up on the low road to leeward, but once again, Team New Zealand was faster into mark 1, leading by 4-seconds. „They had some pretty impressive acceleration off the starting line,“ Spithill acknowledged. 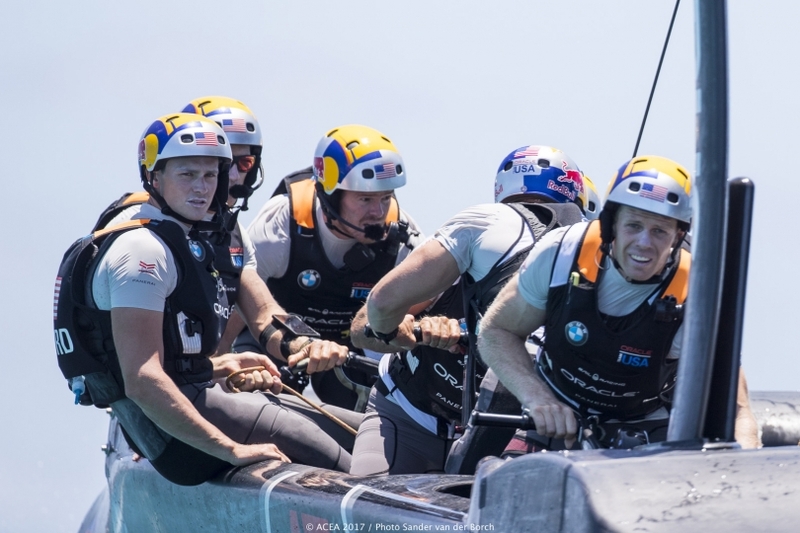 On the first run, the Kiwis were able to extend to a 100 meter margin, before Spithill and Slingsby elected to split at the bottom gate. But on this first upwind leg, the Kiwis elected to cover loosely at the first cross, which limited the opportunities for ORACLE TEAM USA to make a gain. As the race progressed, the New Zealanders made more gains to win and finish the opening weekend with a 3-0 lead in the America’s Cup Match.